Police officers in several Bay Area cities are starting to get used to the newest piece of equipment in their arsenal: a body-worn camera. But the devices being used by cops in one East Bay city are sporting a unique feature. 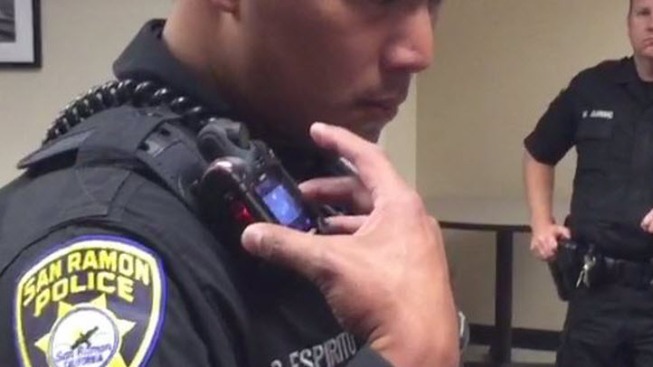 San Ramon became the first city in California to purchase a body-worn video system equipped with an outward-facing playback display that shows what is being recorded. San Ramon officers are already being trained on how to use the $800 camera. "I think it keeps everybody accountable," motorcycle Officer Bill Doherty said. Doherty got to test the device during a recent traffic stop, informing the driver that he activated the camera when he made the stop. The driver is able to watch the video as it records. The cameras already are popular with European law enforcement agencies. At the end of a shift, Doherty and other officers place their cameras in a smart dock, and the video is uploaded to a cloud-based server, where it will stay for a year - or indefinitely if the video is used as evidence. "From that point, everything is managed through an evidence management software," Lt. Denton Carlson said. Carlson said the department felt these type of cameras offer more transparency. As for those concerned about privacy, Carlson said there is a legal standard for public places. "If you're in a public place, you're freely able to record what's going on in that place," he said. The city bought 40 cameras to be distributed to officers over the next few months. The total price tag was about $33,000.